ICAST 2018 is usually a time of year that all anglers look forward to. This is where all the fishing companies come together in Orlando, FL to show off all the new fishing gear that will be coming out soon. 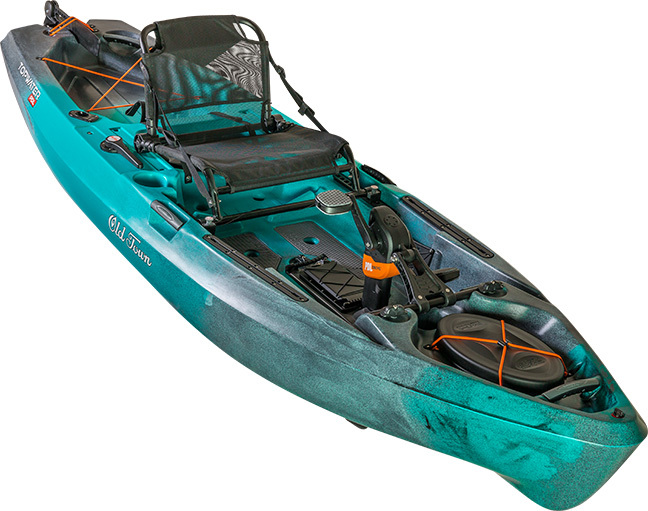 Of course, always high on our list is all the new fishing kayaks that will be coming out soon. Here’s our take on the new yaks you will be seeing very soon. We have to admit that this is a pretty cool designed “kayak”. Immediately looking at the 360 Angler, you automatically know it’s gonna be stable, but that’s not where the features end. The Angler 360 boasts 25sqft of platform, 4 storage hatches, a raised captain’s chair, pedal drive and many other features. 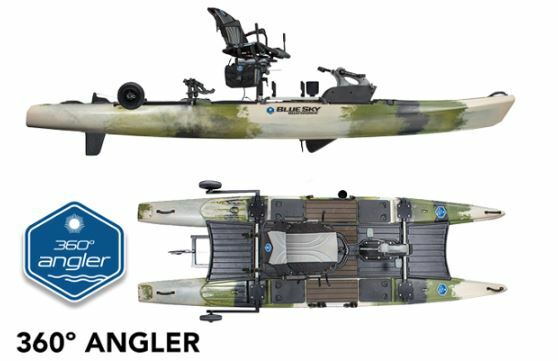 Now, the weight and price tag on the Angler 360 shouldn’t be taken “lightly” either. 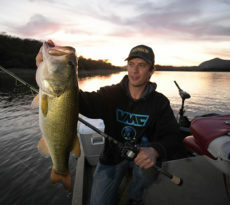 The weight of the Angler 360 is 170lbs with the seat and the drive, and the price is a robust $3499. Jackson upped their game in the pedal drive market by updating the popular BigRig kayak. Revamped and now available in a pedal drive, the BigRig FD should be amongst the favorites with Jackson Kayak fans. Updates include an elongated hull for better tracking, rod staging area, and tons of tracks for rigging accessories. The BigRig FD weighs 120lbs with the seat and drive and comes in at a whopping 40″ wide. The MSRP on the new BigRig FD is $3299. 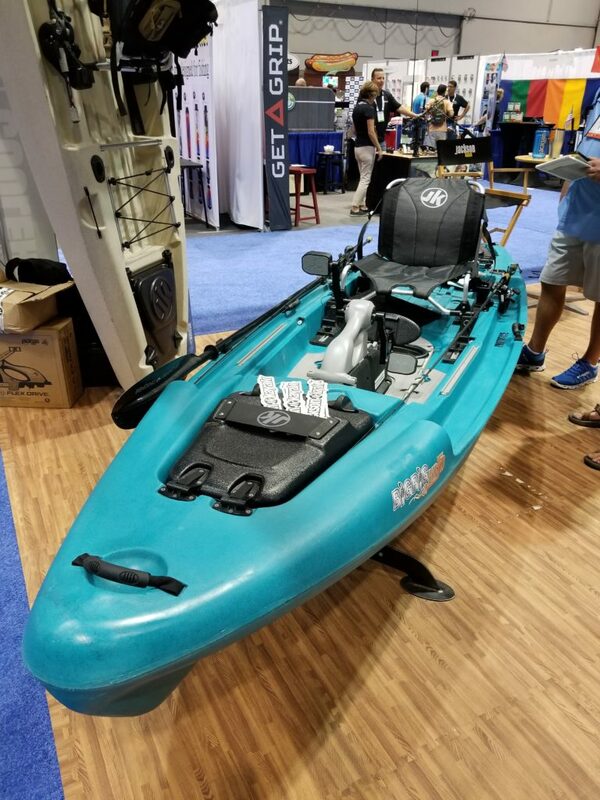 Old Town introduced 3 new kayaks in their Topwater Series, including the anticipated Topwater PDL. 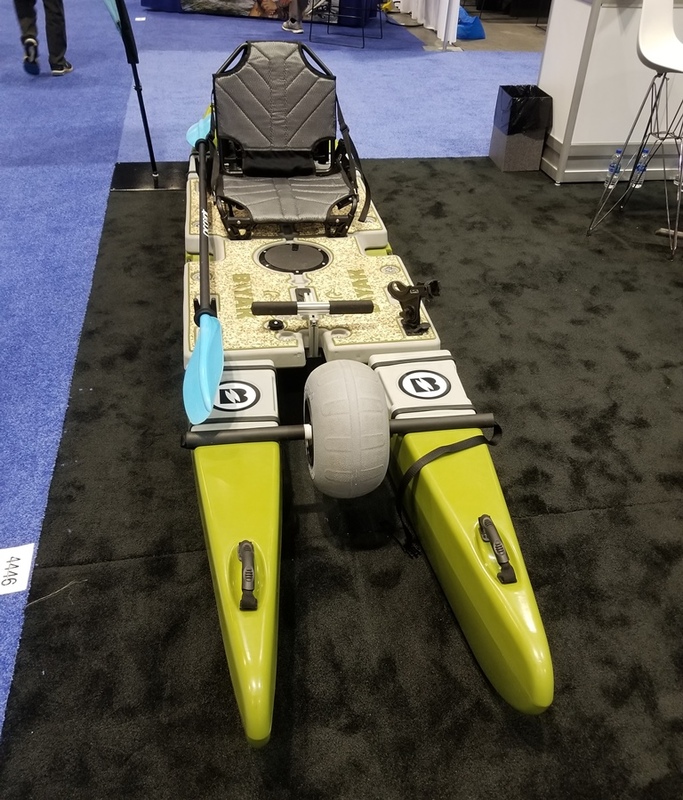 This is Old Town’s entry into the sub 2K pedal drive kayak market. The unique design gives the Topwater PDL all the features you’d want in a larger kayak but in a now compact model. What’s even more impressive is that the Topwater PDL weighs only 100lbs with seat and PDL drive! 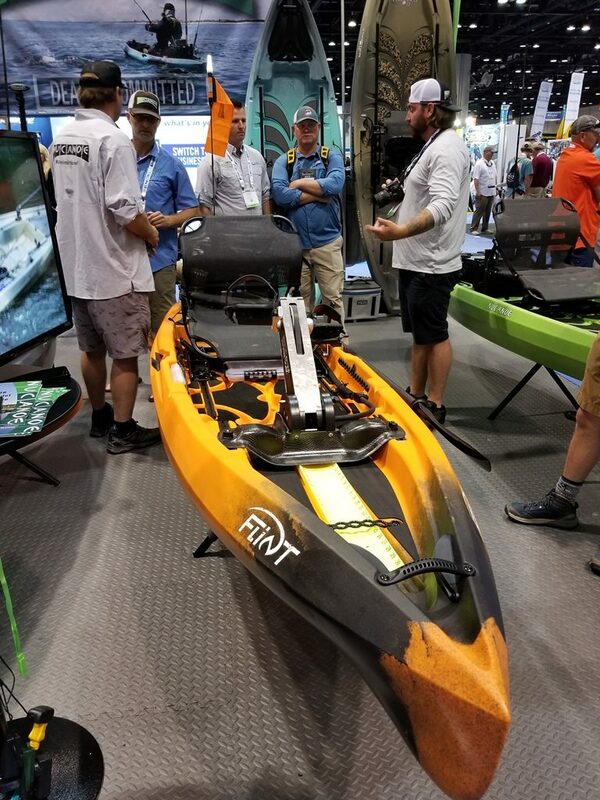 Probably the most talked about debut at this year’s ICAST show was the new pedal drive kayak from Pelican, the Catch130HD. While many mocked that the drive mocked the old Hobie pedal drive, none can mock the price point. 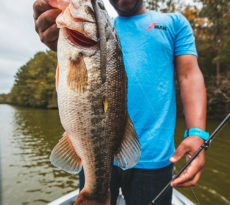 Expected to retail around $1500, the new Catch 130HD will give anglers an affordable avenue to test the pedal drive market. 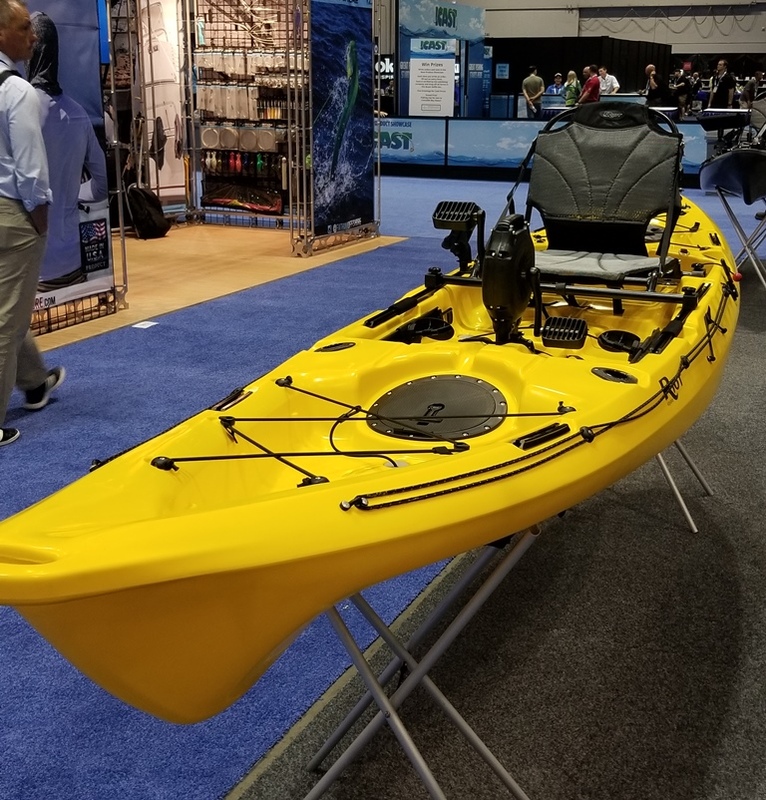 We have to admit ourselves that this was definitely a great looking new kayak from Pelican. Bonafide Kayaks burst onto the scene last summer with their SS series of kayaks leadership of YakAttack mad genius Luther Ciphers. This year Bonafide introduced a sub $1K kayak with the SS117. The new SS117 is a little over 11′ long, 33.5 inches wide, weighs only 75lbs, and has a capacity of 425lbs. 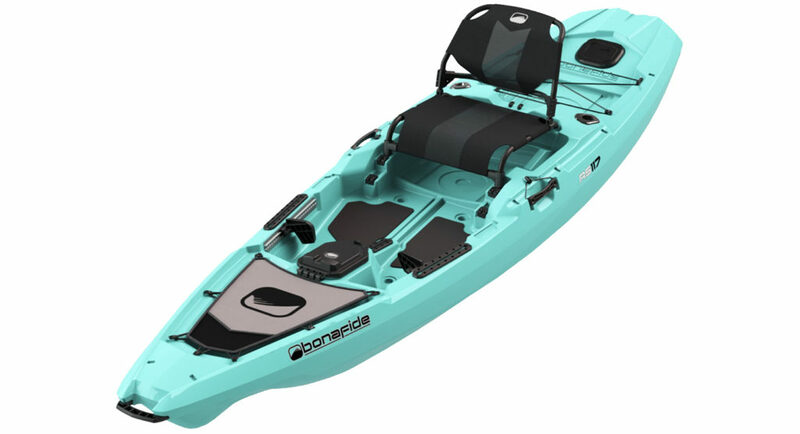 Bonafide also unveiled some new colors as well as new wraps to really pimp out your kayak. I have to admit, the American flag wrap really caught our eye! Admittedly, I have always been a fan of the NuCanoe line of kayaks. They’re stable, paddle and track extremely well, and I absolutely love the open deck concept of their kayaks. Last year, NuCanoe unveiled the Flint (yeah that orange & black color is pretty sweet!) at ICAST 2017. This year NuCanoe showed off their new pedal drive system (Pivot Drive) which can be used on any NuCanoe kayak. The cool part of the Pivot Drive is that it actually steers from the rear of the kayak, so the angler should be able to turn on a dime. I have to admit that I never really knew anything about Riot Kayaks, or their Mako series at all until the ICAST show. We checked out both the Mako 12 and the Mako 10 kayak. 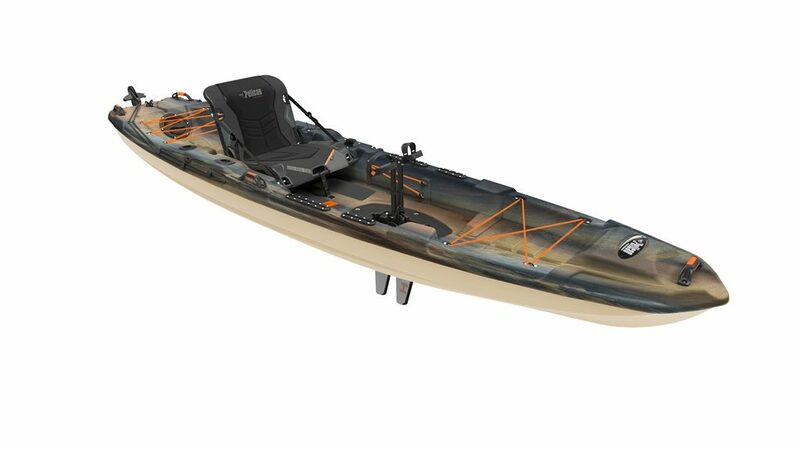 The Mako 10 is a 10 foot pedal kayak with a price tag of at $1000! The Mako 12 comes in at only $1300 as well. 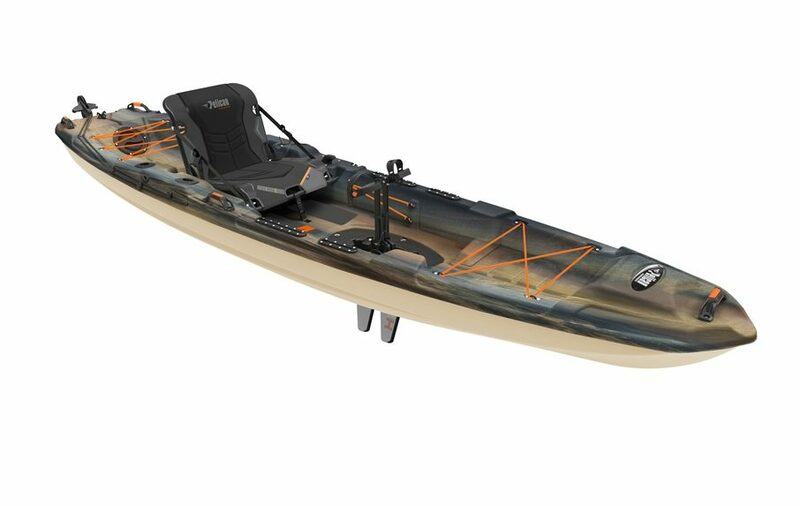 Design wise, we honestly thought the layout of the Mako 10 was better suited for kayak anglers. While I wasn’t too keen on the front hatch area of the kayak, the ability to buy a pedal drive kayak under 1K is definitely an eye opener. We’re curious to see how well this kayak handles on the water and how the pedal drive holds up. Biyak Boats introduced themselves at this year’s ICAST show and were pretty impressive. 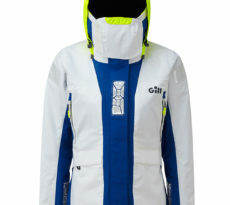 They’re unique in that the width of the craft can go from 30″ wide to 50″ wide with relative ease. The Biyak retails from $1700 stock to a fully loaded, ready to go fishing powered craft at $2900. This was truly a unique watercraft and looks like it would be a lot of fun out on the water. 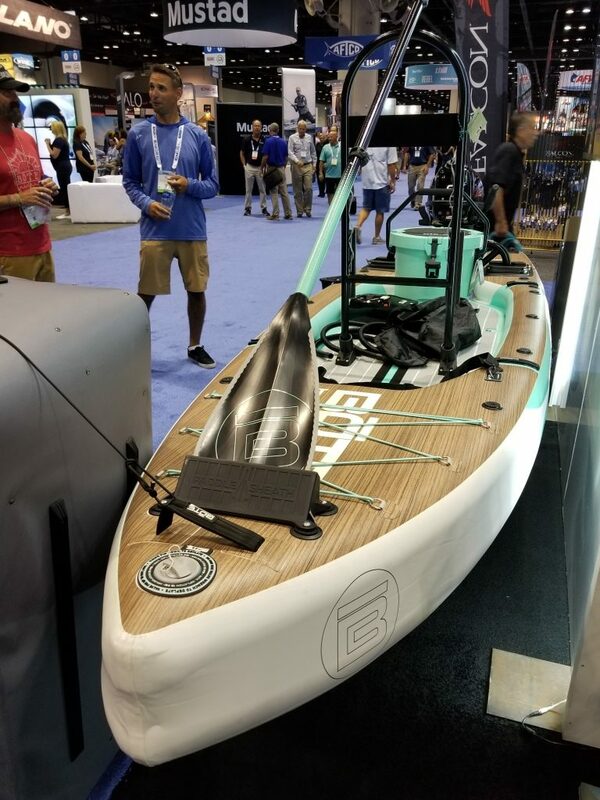 BOTE Board introduced the Rover Aero, which is an inflatable version of last year’s killer Rover SUP. This is a unique watercraft as it can be folded up small enough to take on an airplane for your next adventurous fishing trip. Also cool about the new inflatable Rover is it can be paddled or you can outfit it with a small outboard.